A beautiful keepsake to treasure forever! Pressions is unlike any other kit on the market! �The process allows you multiple opportunities to get the perfect print.� Simple, easy and fun! Pressions prints are made in sand allowing you multiple opportunities to get the perfect print. If it does not work the first time simply try, try again! 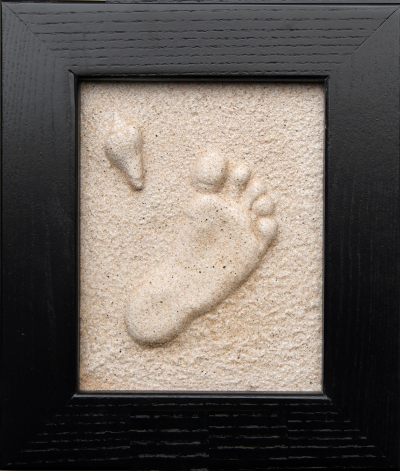 The kit includes: quality frame, sand, plaster, spreading board and complete instructions. The finished product is a raised print with a lovely sand finish, presented in a beautiful solid wood frame. Not just for babies, children up to the age of 8 will enjoy making their own prints and will be so pleased and amazed at the outcome! You will be proud to display Pressions in your home for years to come! !